As founding members and passionate supporters of Project Haystack, we always look forward to Haystack Connect. The conference is a great opportunity to network and create synergy with other members of the Project Haystack community, and the presentations are always top notch. This year’s conference is at Paradise Point, an island resort on Mission Bay in San Diego. This beautiful setting is going to make for a spectacular conference that always lives up to its reputation. Besides the amazing location, the Project Haystack team has really stacked the deck with great speakers and programs this year. Here’s a look at the line-up. As always, there’s a great line-up of industry leaders who will be speaking on a variety of topics related to Haystack tagging and data modeling. You can catch the J2 Innovations team at the following talks. We’re also looking forward to hearing from Michael Wetter, PhD and Staff Scientist at Lawrence Berkeley National Laboratory, as well as hearing the Keynote from Jim Fletcher of Momenta Partners. Jim’s topic is: Well You Didn’t Know What You Didn’t Know: Bringing Organization to the Data Chaos, to Derive Insight and Generate Actions - the capabilities and disruptions that a data-driven future will create. Haystack Pitchfest is new this year and we are excited to check it out! 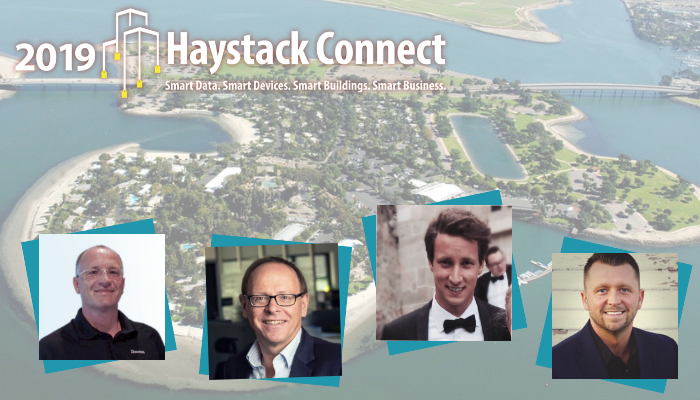 Haystack Pitchfest will showcase new products and services using Haystack—think "Shark Tank" for data. Companies will pitch both commercial products and open-source initiatives in a rapid-fire session. In addition to the sessions and Haystack Pitchfest there will also be an expo hall, plenty of networking opportunities, and the return of the Interoperable Blues Band! There's a lot to learn, see, and do at Haystack Connect, and J2 Innovations is proud to be a sponsor. Click here for the full schedule.